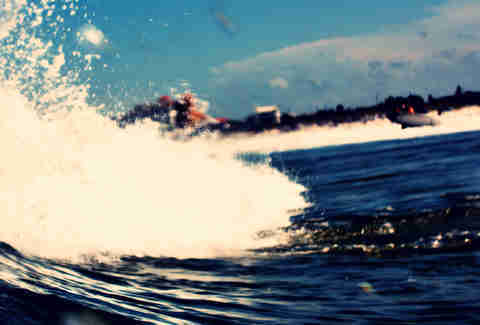 Surfing any size wave -- from ankle-slappers on your maiden oceanic voyage to waist-high peelers and head-high grinders -- will get the blood flowing. 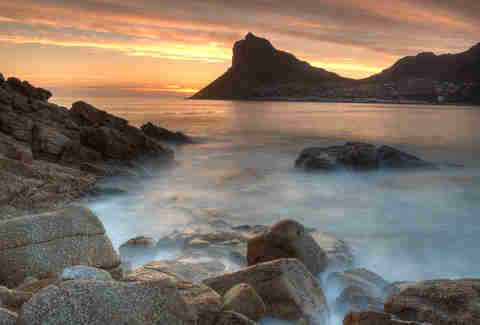 Humans inherently feel small away from land, surrounded by the vast immensity of the ocean. When waves roll toward us and we point our surfboards toward shore, harnessing one of Earth’s most elemental energies, the excitement is undeniable. Pipeline is both powerful and perfect -- sometimes destructive, sometimes flawless, but always an adrenaline-pumping challenge, even when it’s small. First surfed in the early 1960s, it breaks over jagged tendrils of reef that in some places (and on some tides) are less than a foot below the surface, raising the stakes for any surfer lining up a big set. Of course, that isn’t easy: thousands of courageous surfers have made their careers by learning every bend and nook of this break (Pipe goes left, Backdoor goes right), which means the crowd here is thicker and more unforgiving than at any other surf spot in the world. 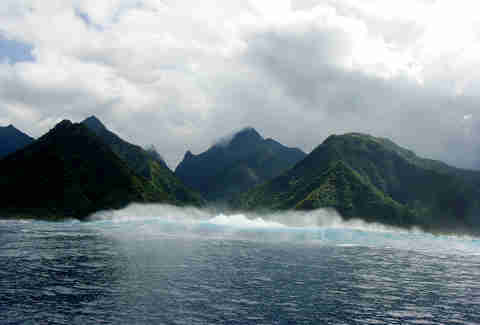 Teahupoo (Te-a-hoo-po) or “Chopes” is widely considered the heaviest wave in the world (roughly translated, the word in Tahitian means “scraped” or “severed head"). On an average day, this beautiful blue water peels perfectly across an incredibly scenic reef that sits at what locals and tourists call the “End of the Road.” But when the South Pacific roars to life, Teahupoo turns into a below-sea-level beast that can grow wider than tall, doling out either the biggest, gnarliest barrel -- or the worst wipeout -- of a surfer’s life. Jeff Clark famously surfed Mavericks alone for 15 years before convincing anyone to paddle out with him; that’s how spooky this fog-cloaked, cold-water wave is. 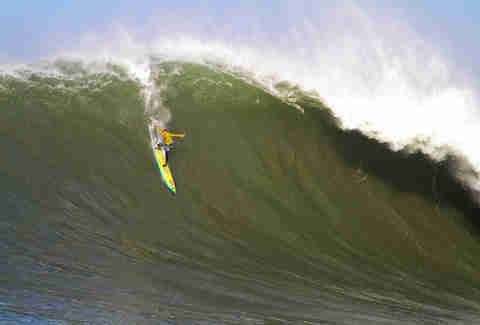 Breaking off a steep headland, an entire generation of big-wave surfers has used Mavericks to prove their mettle. A scarily steep drop puts surfers right in “The Bowl,” where they either successfully avoid Mavericks’ thick lip -- or end up navigating the spot’s boulder-strewn shore break. Imagine hiking for half a day -- or taking a bumpy, open-ocean 30-kilometer boat ride -- to reach a mutant wave that unloads in front of a jagged cliff that’s on the literal bottom of the world. Then imagine that wave doubling and even tripling up, folding on top of itself as Aussie and Tasmanian madmen whip each other directly into its violent guts while being behind jet-skis. Every time it turns on, Shipstern’s provides an adrenaline rush of epic proportions -- there are no in between or half measures here, especially since the nearest sign of civilization feels worlds away. Jaws sure lives up to its ferocious billing. Originally ridden by windsurfers who could survive its heavy, hollow teeth thanks to Mother Nature’s assistance, Jaws today attracts the best big-wave surfers in the world -- and humbles every one of them. Like most surf spots on Maui’s rugged coast, simply reaching the water’s edge at Jaws is an adventure on its own. Figuring out how to paddle through the explosive shore break is enough to scare off most comers. 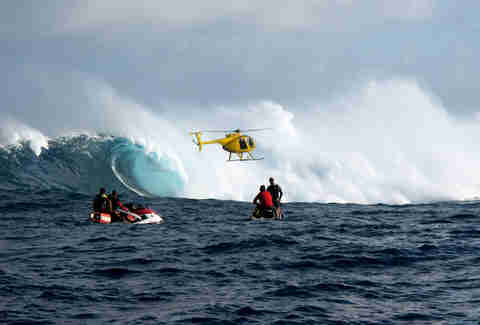 But even with boat or jet-ski assistance, lining up and successfully riding a mountain of water moving as fast as Jaws does is considered a Holy Grail of surf experiences. Southern California is the hotbed of the modern surf industry, with mind-boggling crowds and mostly user-friendly waves. 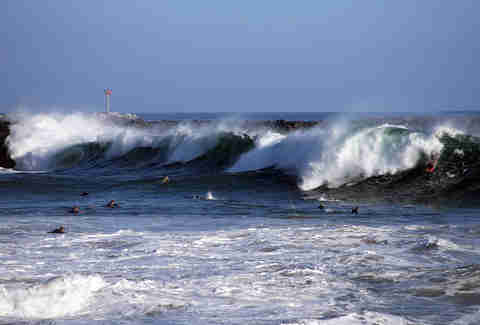 But at The Wedge, the right swell angle refracts off of a Newport Beach jetty and careens sideways toward shore, giving bodysurfers, boogieboarders, skimboarders, and the occasional manic stand-up surfer the chance to hurl themselves over the lip of triangular teepees that reach for the heavens before crashing down onto dry sand. 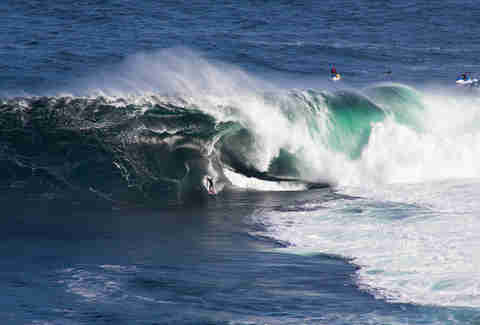 Add in the thousands of spectators that create The Wedge’s arena-like atmosphere and you get one of the most heart-pumping novelty waves on the planet. Picture wave after 15-foot wave crashing onto a flat, chest-deep sandbar, with ferocious rip currents churning the waters in between sets, and you’ve got a good introduction to Puerto Escondido. 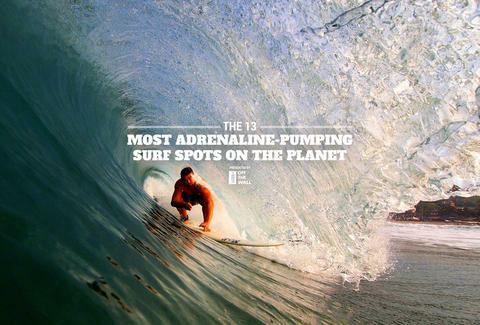 Puerto is the only wave on this list that doesn’t have an underwater or onshore bathymetric feature to help shape its power. Simply making the paddle out at this unrelenting spot is a cause for celebration. And if you successfully make two or three waves during a day’s worth of punishing wipeouts, you’ve just succeeded at surviving what many consider the heaviest beachbreak in the world. Cloudbreak is the rare wave that actually gets more perfect as it grows in size. Breaking off the edge of a heart-shaped reef that encircles the Fijian island of Tavarua, one of surfing’s earliest all-inclusive surf resorts, it might be the most user-friendly adrenaline-pumping surf spot, too -- if you can surf fast, of course. Cloudbreak actually increases in speed as it peels off in near-perfection, which means the feeling of making one of its flawless barrels is as intoxicating as it gets. “Ours” is an awfully optimistic name for a wave that detonates atop a submerged rock slab and then sends backwash hurtling up a sheer cliff face. 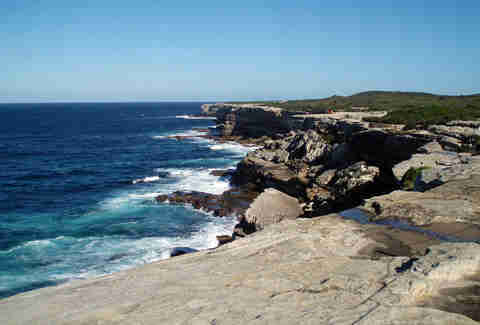 But its moniker comes from the aspect of the wave that will get your blood pumping the most: its ultra-tight local crew of “Bra Boys” (named after nearby neighborhood Maroubra), who rule Ours with an iron fist. This is exclusive territory, and rightfully so -- the freakish shape of Ours is never the same on any two waves, sending surfers flying through the air or washing them up on rocks more often than ushering them successfully through its mutated barrel. Frigid water + an underwater field of semi-truck-sized boulders + nearby Seal Island (one of the world’s most notorious great white shark feeding grounds) all add up to make Dungeons, one of the world’s most terrifying waves. Breaking over unusually deep water, Dungeons delivers hold-downs that can clean even the most seasoned surfer’s clock -- if you can avoid the shifty sets that push off both sides of the spot’s main peak, forcing everybody in the water to be even more on their toes. 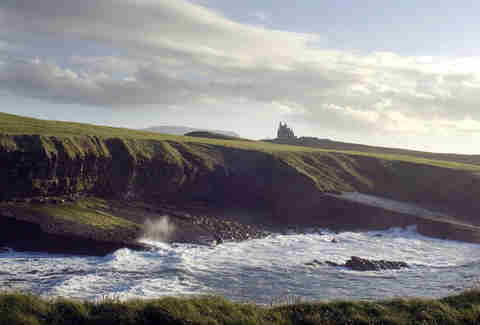 One of the world’s more recent big-wave discoveries, Mullaghmore is shrouded in the cold and wet weather that coastal Ireland is famous for. Maybe the wind, rain, and frigid water kept all but the craziest Irishmen from having a go at this beast. Or maybe it’s because the most recent class of international heavies who’ve descended on Mullaghmore during massive North Atlantic storms compares its girth with waves like Teahupoo. With no easy access and only a few days of good weather a year, having a go at Mullaghmore is currently one of the scariest ways to get your jollies. Like Mullaghmore, Nazaré is a relatively recent conquest -- perhaps because the Portuguese spot sits at the business end of an incredibly deep, narrow underwater canyon. That funnels 70- to 80-foot swells directly toward this exposed west-facing break, with nothing to slow them down or break them up. 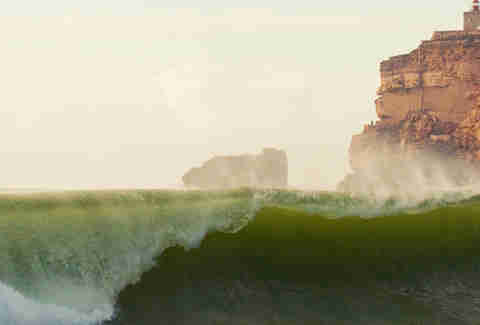 Although it was originally considered a “soft” big wave due to its lack of a lurching top-to-bottom lip, several potentially Guinness World Record-setting waves have been ridden just beyond Nazaré’s picturesque shoreline over the last few years. The eternal quest to successfully ride the world’s first 100-foot wave begins and ends here each winter. So what if New Smyrna Beach Inlet’s waves rarely top six feet? Or if the water is warm year-round? Or if public beach driving provides it some of the easiest access in the world? What’s beneath the surface in this epicenter of Florida surfing is what will spike your adrenaline. Coined the “Shark Bite Capital of the World,” local lore says you’ll come face to face with a dorsal fin and caudal fin and sharp teeth every other time you paddle out here -- or a shark might just jump over your damn head. None of the native species are considered man-eaters, but fingers and toes are fair game for the spinner sharks that torpedo through the shallows feeding on fish continuously flushing in and out of the inlet. If that’s not enough to get you pumped up, during the summer New Smyrna Beach often holds the only rideable wave in all of Florida. Which means the sharks aren’t the only aggressive species populating these waters. 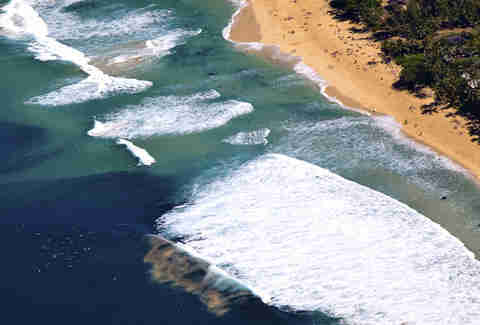 Tread carefully and know your limit, as you should if you’re thinking about braving any of these surf spots.